President Donald Trump announced through Twitter on December 19 that the Islamic State (ISIS) had been completely defeated, and, as a result, U.S. soldiers would immediately be withdrawn from Syria. That decision drew immediate backlash from U.S. policymakers, Middle Eastern allies, and members of the anti-ISIS coalition operating within Syria. Members of Trump’s national security team were also against the decision, with Secretary of Defense James Mattis resigning the day after the president’s decision in protest. A number of concerns have arisen regarding the U.S. withdrawal. In Syria, Kurdish soldiers from People’s Protection Units (YPG) have been some of the United States’ most stalwart allies in combating ISIS and other terrorist groups operating in the region. By withdrawing from Syria, the Kurds would be left largely undefended from Turkey, which has been fighting a war against violent Kurdish groups for decades. Turkey considers the YPG an extension of the Kurdistan Workers’ Party (PKK), a Kurdish organization that has long fought Turkey in hopes of achieving an independent Kurdish state. Turkey, the European Union, and the United States all consider the PKK to be a terrorist group. Although Secretary of State Mike Pompeo has promised Kurdish political and military leaders that the United States will continue to support and protect them in Syria, there is still concern over whether these assurances will hold. While the United States has offered such support, the YPG has offered the Syrian military entrance into Kurdish-held areas like the city of Manbij, worried about threats from Turkey and ISIS and feeling betrayed by the prospect of U.S. withdrawal. Furthermore, experts suggest ISIS continues to present a threat in Syria. Trump’s claims that ISIS has been defeated have been contested. ISIS is estimated to have anywhere between 5,000 and 30,000 soldiers still operating in Iraq and Syria as of June 2018. In addition, by withdrawing the 2,000 American soldiers from Syria, some have begun to question America’s future involvement in the region. National Security Advisor John Bolton said that the U.S. withdrawal would be done in such a way that Israel’s security would be taken into consideration, reaffirming the importance of Israel and its security to the United States. The Israelis are primarily concerned about Iran. American soldiers in Syria buffered Iranian attempts to arm the Syrian regime and Hezbollah, a terrorist organization operating primarily in Lebanon, which borders Israel to the north. With American soldiers withdrawn, Israel worries that Iran will increase its efforts to arm groups that aim to harm Israeli interests and citizens. In spite of these reactions and concerns, the immediate future of American involvement in Syria is murky at best. 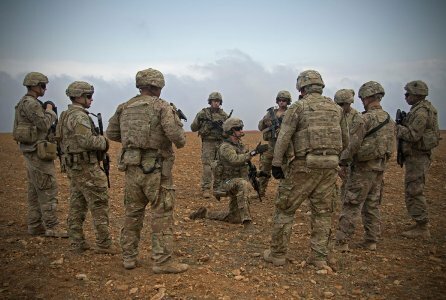 The Syrian Observatory for Human Rights has reported seeing U.S. soldiers leaving their base at Rmeilan, in northeastern Syria; however, U.S. government officials have said that, although some supplies are being extracted, no soldiers have been removed as of yet. Furthermore, Bolton has said that American soldiers will remain in Syria for as long as ISIS is a threat, contradicting Trump’s earlier statements.